As we approach the longest day maybe it is time to retreat into the shade with a long cool drink and plan our fantasy dream gardens – whether in a couple of containers or a whole terrace. May I suggest the planning and design of a small space dedicated to white flowers through the year. The Mediterranean climate zones normally have native evergreen trees and shrubs and these can provide a great backdrop for colour but maybe even more effectively for the cooling shades of white and cream flowers. 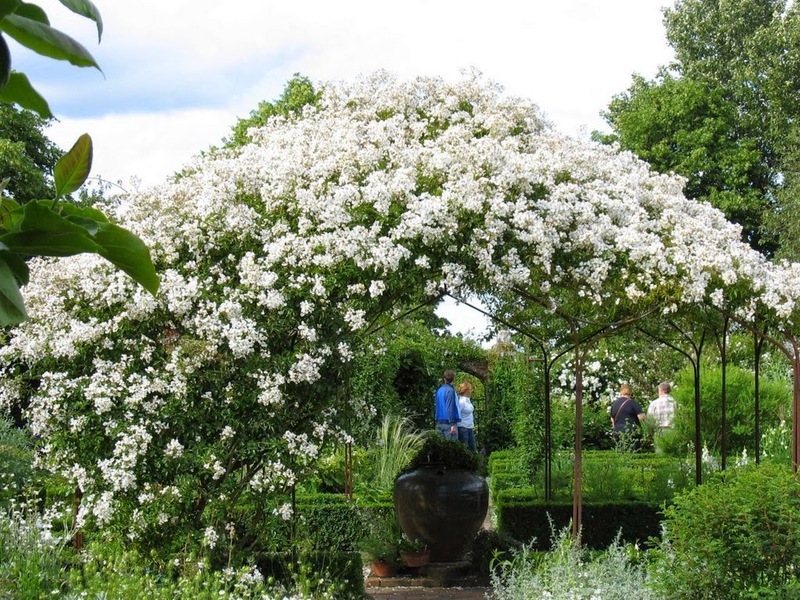 It does not take a huge leap of imagination to be able to call to mind the famous white garden at Sissinghurst in Kent if an example is needed. Inspired by the insomnia of famous creator, Vita Sackville-West, while wandering round the garden at dusk and in darkness and when better to see a white garden than by the light of a full moon ? The layout of the separate buildings at Sissinghurst also meant that a walk through the garden at all hours was necessary for the family to reach meals or bedrooms. 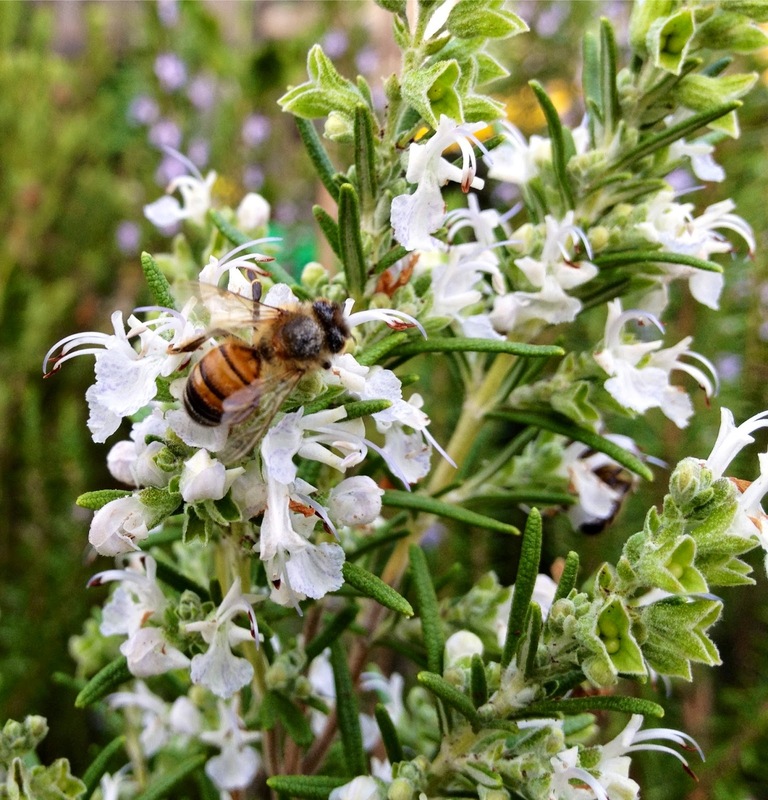 White flowered plants could be the perfect choice for your outdoor dining area, on the terrace or under a pergola, quite often they have lovely perfumes which are released onto the air in the evenings. What it is important to remember is that Mediterranean climates will need a very different selection of plants to provide the same glorious effect. So the fun starts, looking for white flowered plants that will be tough enough to cope with little or no irrigation. At the moment we have Clematis flammula flowing over shrubs and trees with a profusion of white frothy flowers which will be followed by lovely silky silver seed heads. If you are lucky enough to have this in your garden or land then you can train the new growth into adjoining shrubs, over obelisks, trellis or fences for a great show over the next few weeks. Other clematis with white flowers suitable for our climate include C. cirrhosa from Majorca with lovely cream and pure white forms available. If you also have the native Myrtus communis then you already have two white flowering perennials. The small sweetly fragrant, creamy white flowers with many long golden stamens of the myrtle are very much sought after for bridal bouquets and are followed by dark berries useful for flavouring and used in folk medicines as a mild antibiotic. As a focal point nothing beats Magnolia grandiflora when it opens large upright waxy white flowers smelling of lemons. 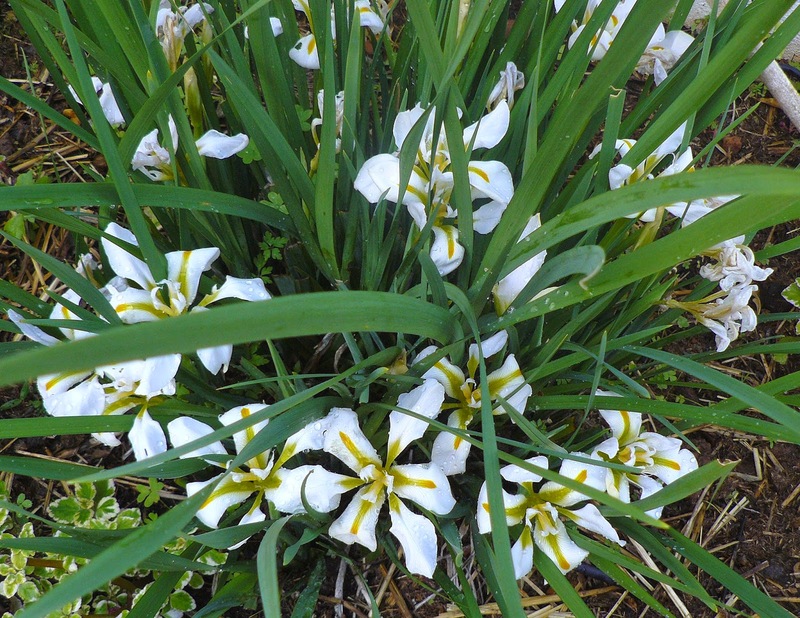 There are white flower versions of many of the native and naturalised shrubs and plants, white cistus, rosemary, lavender, oleander - white agapanthus and even white flowered pomegranate varieties, Iris albicans and the winter flowering Iris unguicularis 'Alba'. 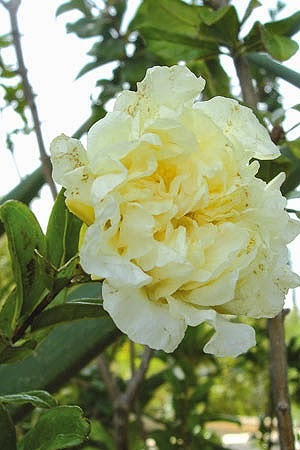 We also should not forget citrus flowers are white and highly perfumed and a classic Algarve shrub, the cream flowered Dama da Noite (Cestrum nocturnum) which fills the night air with perfume a long way from the plant itself. 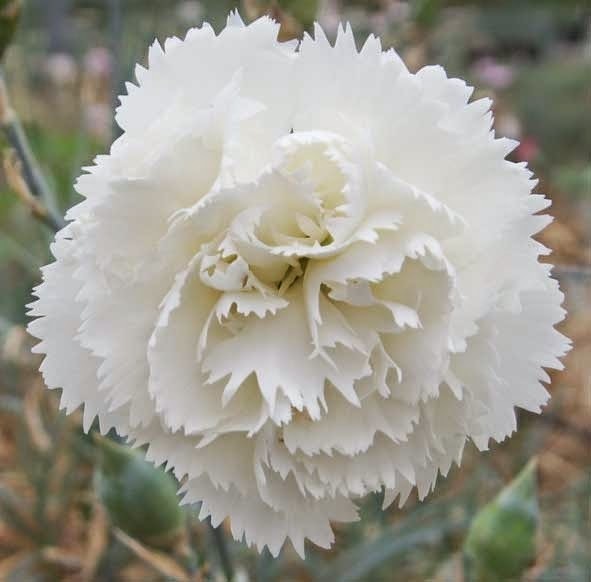 As understorey planting why not try pinks which are white, the classic highly perfumed Dianthus ‘Mrs Sinkins’ and other more modern hybrids, Allwoods Nursery in the UK has an amazing selection and an excellent mail order service. Rosa mulliganii provides the stunning centrepiece for the round pergola at the centre of the white garden at Sissinghurst, surely one of the most photographed plants in the garden. This massive rambler is one of the biggest of all climbing roses. It produces small, white flowers, held in huge broad trusses and followed by small orange-red hips in autumn. Fine, glossy, almost evergreen foliage, with leaves of seven leaflets, late season flowering in the UK but maybe earlier here. In general, species roses are tougher, disease resistant and strong growers in difficult climates, seek them out, there is plenty to choose from and you could start with Rosa banksiae. Other white climbers do well here, Tracholospermum jasminoides, Jasminum polyanthum and Wisteria chinensis alba. Bulbs can also make a contribution, Scilla peruviana has a spectacular white version, Crinum powellii album has tall multi-headed bell shaped flowers which glow in the shade when planted under carob trees. Lilium candidum and L. regale come with the bonus of perfume. 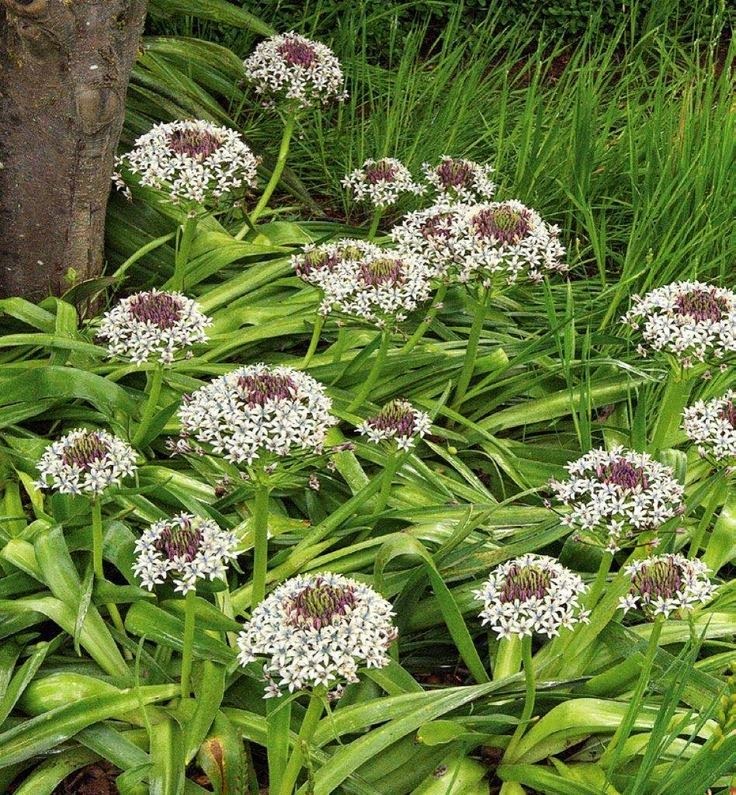 If you have sandy soil try the sea daffodil, Pancratium maritimum, after all, not much flowers so spectacularly in July and August. 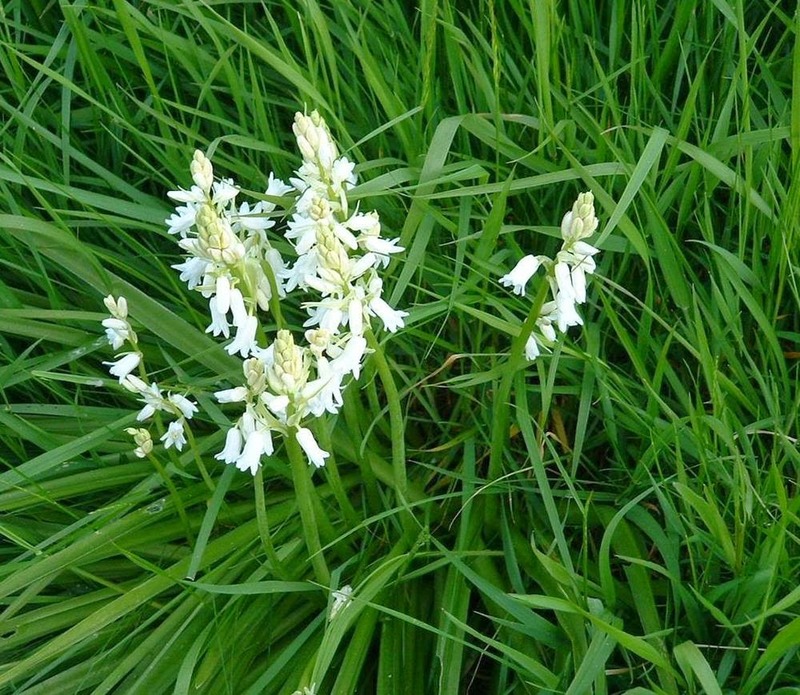 There is also a white form of the Spanish bluebell, Hyacinthoides hispanica which should naturalise and the common white asphodel (Asphodelus aestivus) might even find a place providing tall spikes of white. The best of all must be the Paperwhite narcissus (Narcissus papyraceus) which is native here and flowers mid winter with perfumed clusters of small white flowers. If you live on slightly cooler and higher ground, how about including the self seeding white foxglove and the white honesty? Maybe you will find your own ‘garden selected’ forms with white flowers, that is how most white flowered forms were introduced into cultivation, you might enjoy strolling in the garden by the light of the moon. A selection of other white flowered plants, some more challenging than others!